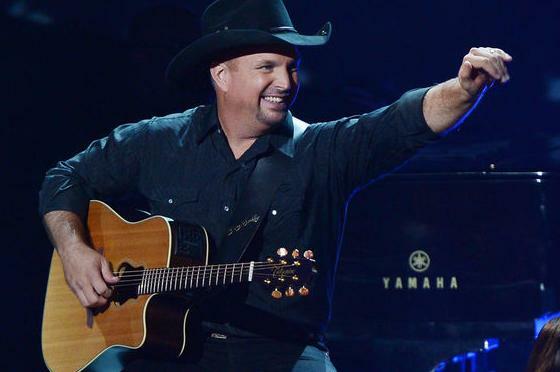 I am not a fan of Country Music, nor have I ever had any interest in Garth Brooks … until now. I do know that Mr. Brooks is one of the biggest Country Music legends of all time, and when I hear of such a humble, God-centered attitude coming from someone of his public stature, I think we should all take notice. I give Garth Brooks a big STAR for avoiding the trappings of stardom and choosing to live an unselfish life that will surely have a positive impact on his three daughters as they begin their own lives. Please read the article below from People.com. It’s been 14 years since Garth Brooks last toured, but the country music superstar is turning out to be quite the comeback kid. His ninth studio album, Man Against Machine, has been certified platinum, and his world tour with wife Trisha Yearwood, 50, continues to break ticket-sale records across the country. Not to mention Brooks is up for what could likely be his seventh entertainer of the year award at the Academy of Country Music Awards on April 19 (fans can vote here). Yet Brooks, 53, insists all the celebration simply pales in comparison to the years he spent away from the spotlight, raising his three daughters, Taylor, 22, August, 20, and Allie, 18, from his first marriage, to Sandy Mahl. Not that the adjustment was always easy. After he and Mahl divorced and his mom Colleen died of cancer in 1999, Brooks settled in with his daughters in a one-bathroom bunkhouse on his ranch in Oklahoma. The singer’s solution was to mix discipline with fun, and he flourished as his days were filled with packing school lunches (complete with handwritten notes), chores on the ranch and after-school activities from soccer games to school plays. The time also taught him valuable lessons as a father. Brooks admits his return to music full time has helped him face an otherwise troubling empty nest. Touring with “Miss Yearwood,” as he affectionately calls her, has made all the difference.